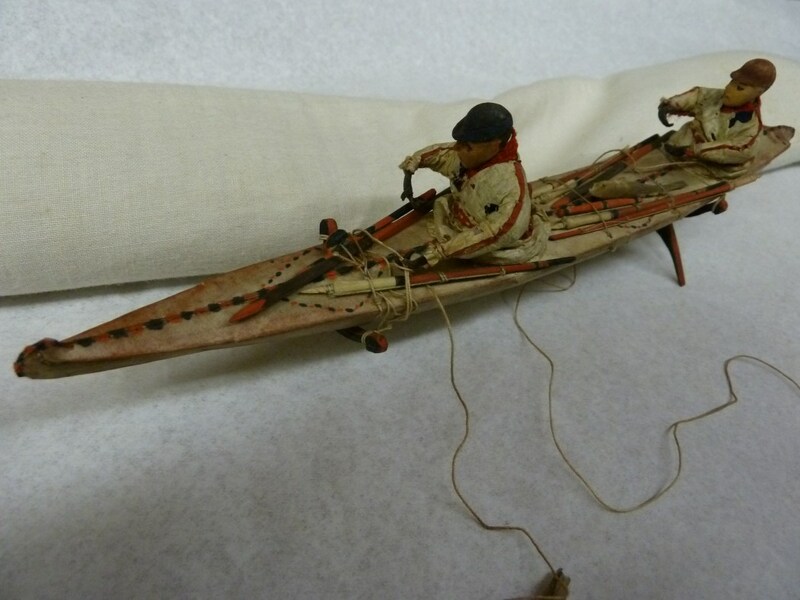 A while back, an article on kayak models appeared in the journal Qajaq. The gist of the article was that models are not to be trusted since most of them were made for sale in the tourist trade and that craftsmen making boat models for the tourist trade soon learned that making an accurate scale model of a kayak takes way too much time for the money it payed, so they learned to take all sorts of short cuts. I believe the article was written mostly about kayak models built in Greenland. The concluding sentiment of the article was that models were worthless for serious anthropological study. And the article has some merit. But recently, in looking at models of Unangan kayaks, I am of the opinion that a good deal can be learned from them. The things you can learn from models is probably endless, but let me point out just a few things by way of specific examples. But first, just a few general comments. The most obvious and recurrent lesson to be learned from kayak models is the overall view. Models show us how the whole thing was put together. We get a picture of the whole ensemble which we seldom have a chance to get in any other way. 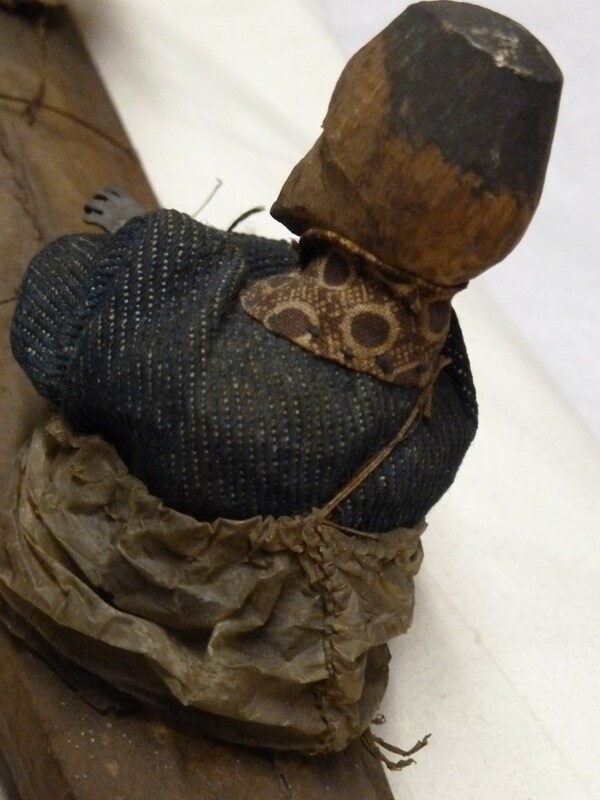 The way artifacts are collected is usually one item at a time, or a bundle of items without any clues on how they all fit together. Then the museum stores them by category and breaks up all the things that belonged together at one time. Harpoons here, paddles there, hats in a drawer, kayaks on a rack and so on. Everything is split up. 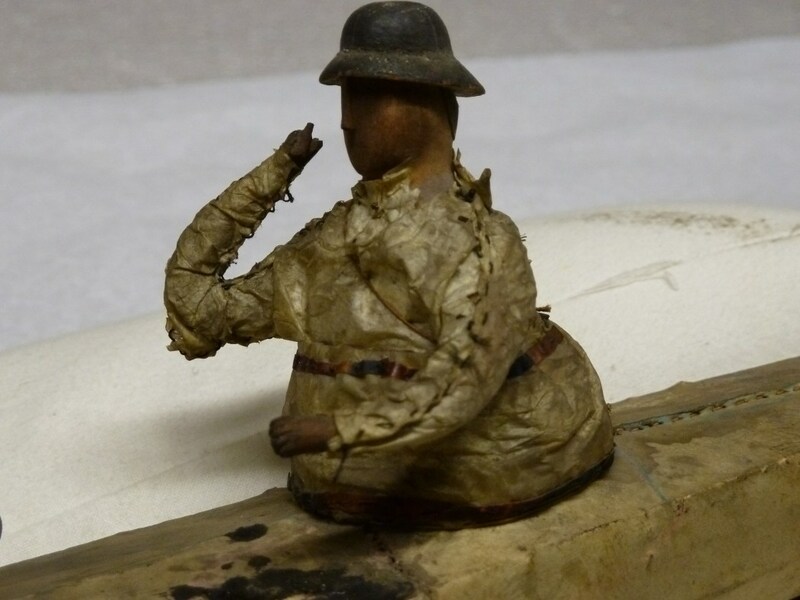 Models fortunately allow related items to stay together. Other clues are more statistical and can be informative if we look at a number of models. For instance, what sort of kayak was most common, one hatch, two hatch or three hatch? What sort of hats were kayakers wearing when the models were made? What sort of game were hunters going after based on the implements on deck? And so on. Not much in the way of a deck load and the paddles have gone awol. But there is a bailing tube on deck. Also, the lower ranking paddler, the one in front is wearing an open crown visor while the paddler in back is wearing a full crown model. And the hair of both paddlers is long and white and both men have beards. 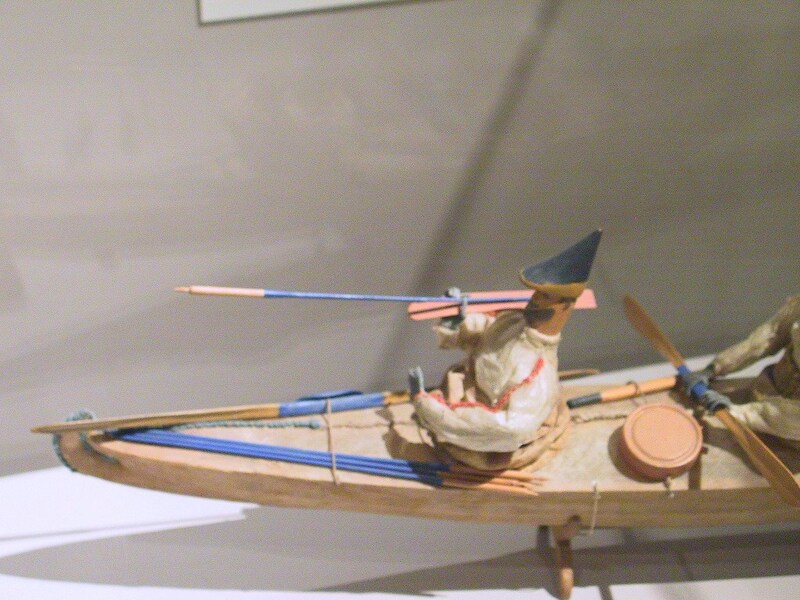 This model is of a three hatch kayak and shows the man in the bow holding a dart and throwing board. This model also shows where the darts were stored, what their relative size was, how they were painted and so on. The paddles are also very nicely carved and appear to be in scale. Just behind the bow paddler is a wooden canteen, an item that I have never seen in a museum but that appears frequently on models. 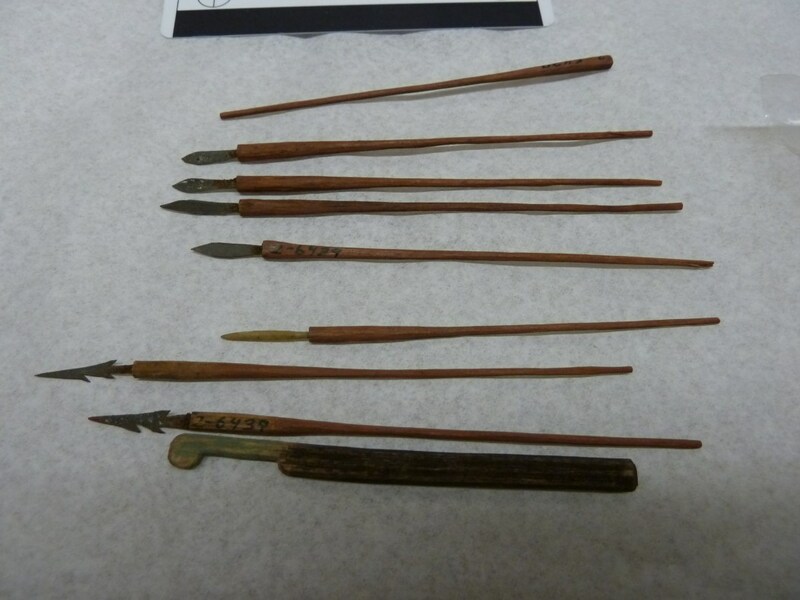 This batch of hunting implements has gotten separated from its boat, but the museum has fortunately kept the pieces together. This boat model is a particular favorite of mine. Lots of stuff on deck. The hunters appear to be wearing western head gear. They have a fish on the line and we can see colored trim on both the kayak seams and the seams of their waterproof skin jackets. And this model gives us a nice view of two paddles with different paint jobs. Again, the paddles seem to be accurately proportioned and carved by someone who also made the full scale version of the various deck paraphernalia. Spray skirts on Unangan kayaks were affixed to the cockpit coaming of the kayak and stayed with the kayak when it wasn't in use. When the paddler wanted to take off in his kayak, he stepped into his kayak and sat down and then pulled up the skirt and threw the strap that held it up over his shoulder. The top of the skirt had a draw string that the paddler could tighten to minimize entry of water. According to Jochelson (1925) some kayakers had a way of tying the shoulder strap by means of two rings which allowed the kayaker to quickly disconnect the shoulder strap in case of a capsize. Back view of a kayak model showing the spray skirt and the single strap that goes over one of the kayaker's shoulder to hold up the skirt. 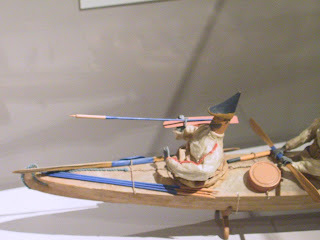 The bottom of the skirt is tied around the rim of the cockpit coaming and the top of the skirt has a draw string that the paddler can tighten to minimize entry of water into the kayak. This model shows the paddler wearing his rain jacket in conjunction with the sprayskirt. Unangan hunter fitted out with a water proof gut skin rain coat that also doubles as a paddling jacket. He is also wearing a bent wood hat and water proof boots that would allow him to get in and out of his boat just off shore to prevent damage to the skin of the boat that might occur if he ran the boat up on shore to get in and out of it. The sprayskirt worked in conjunction with a raincoat that everyone wore both on land and while kayaking. The raincoat reached below the knees and was also fitted with a hood. 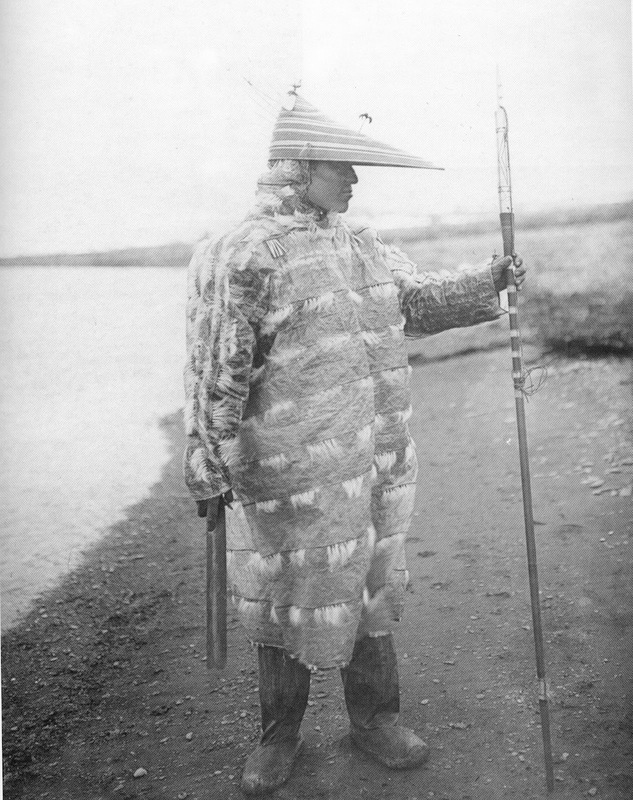 In addition, in times past kayakers would wear wooden head gear while out in their kayaks. In the rest of the Bering Sea region, kayakers wear gut skin jackets similar to those of Unangan kayakers. However, in the Bering Sea, skin jackets are fitted with a draw string on the bottom that fits directly over the coaming and eliminates the need for a separate spray skirt. Part of the reason that Unangan kayakers did not use this method may be that their cockpits were relatively small and a jacket fitted to the smaller cockpit would have made the bottom of the jacket too narrow to walk in comfortably. Paddlers on shore with their kayaks drawn up on the beach. Spray skirts stay attached to the coamings of the kayaks. 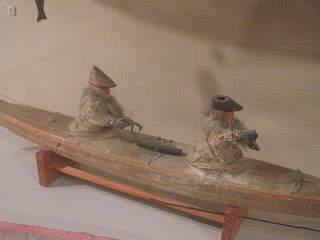 These kayakers are relatively modern and have adopted Western style hats to replace the bent wood hats and visors that they would have worn in the past. If the kayaks were being stored for a little longer time, the sprayskirts could be cinched up at the top and held up with a stick to form a roof over the cockpit opening to keep the rain out. 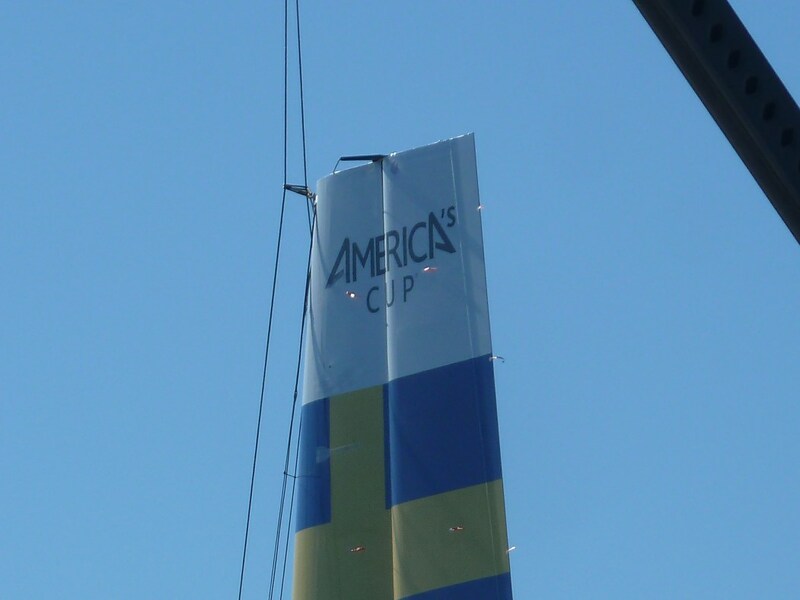 The Americas cup is one of those sailboat races that has been going on for a long time and happens again and again at various intervals. Seeing as it involves large sailboats, only the very rich can compete, albeit with hired crews. 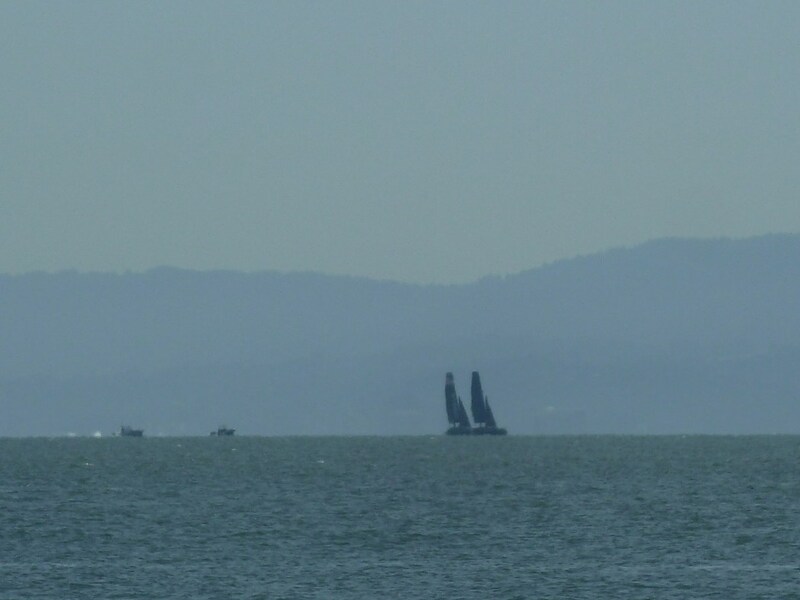 This year the race or part of the race is happening in San Francisco Bay on which I live and so the news about it reaches me. 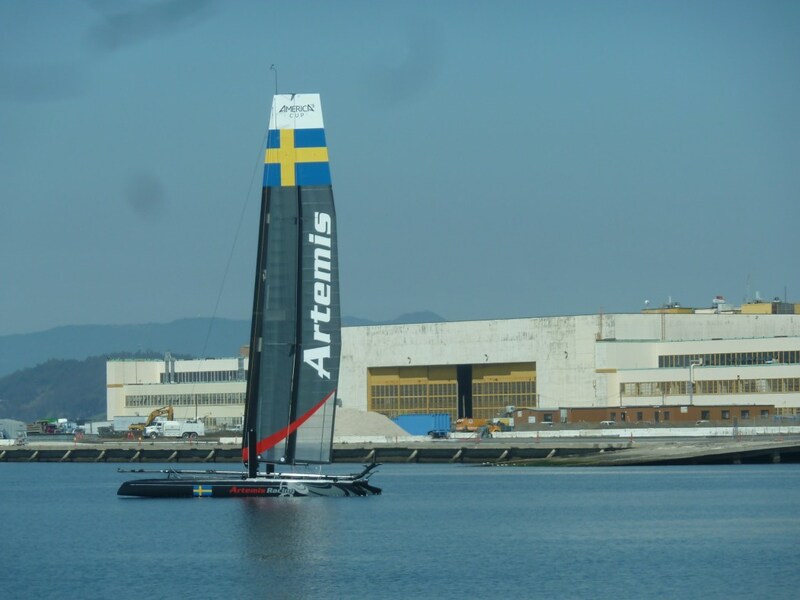 I have nothing to offer on the merits of the race but it did happen that the Swedish race team is working out of an aircraft hangar close to my own modest boat shop and so on the way to work or going home from it, I see the boats that compete in the event. 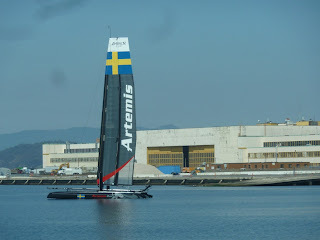 So I want to offer some photos of the Swedish boats because I find the boats interesting. 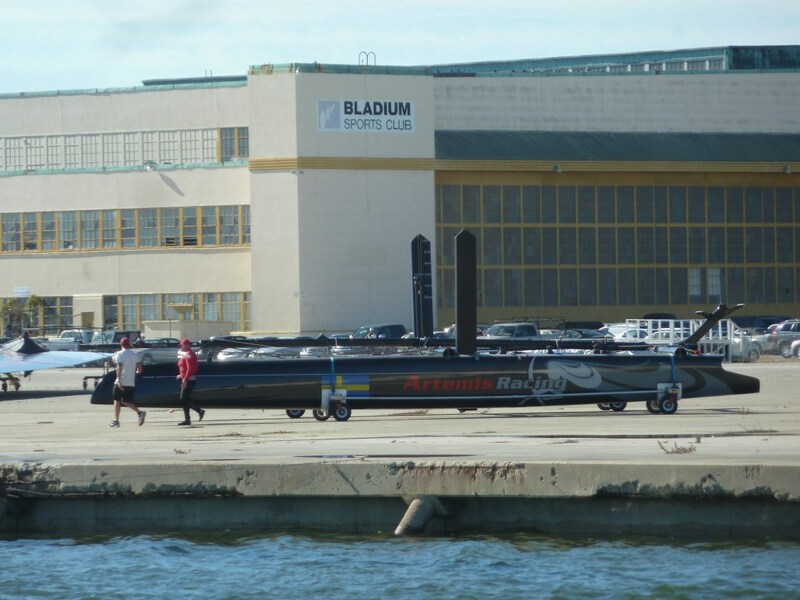 By the way, I understand that the current crop of boats are a short version of what will be in the final competition. And all the boats were built in New Zealand by the same builder to the same specs so that he race is about who has the best crew and not about who has the best boat. This is one of the two Swedish boats tied off to a buoy in the Seaplane Lagoon. In the background, one of the maintenance hangars from the Naval Air Station days. 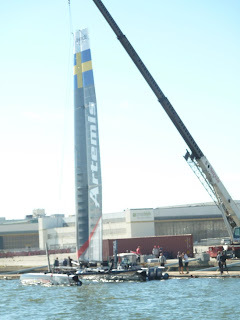 The boats and the sails are moved in and out of the water by a crane. They are not that heavy as boats go, around 3000 pounds. Here is the boat itself, without its rig. 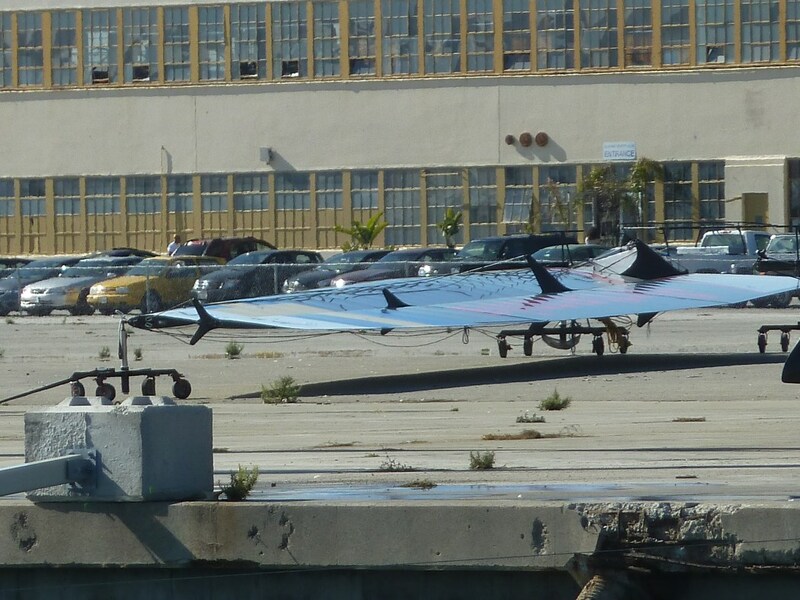 Dagger boards are in their retracted position. 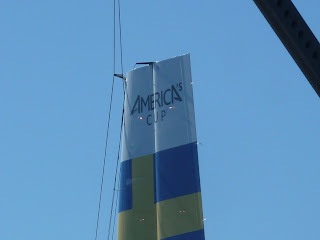 And the America's Cup logo and Swedish flag. The boat has a wing and a jib. The wing is symmetrical about the center plane unlike an airplane wing which is usually flatter on its bottom face. And there are the Swedes, out on the bay doing their stuff with their support boats motoring behind them. Unangan kayak terminology has been set down in an article written by Knut Bergsland, Norwegian linguist, now dead, in Contributions to Kayak Studies, Eugene Arima, editor. I think that's the most commas I've ever put in a sentence. I've been wanting to do an illustrated version of that article for some time, but what has discouraged me is the messy nature of the information in Bergsland's article. The information is messy because there was never just one official way of naming kayak parts in the Aleutians. For one thing, Unangam Tunuu, the Aleut language had multiple dialects, at one time, probably as many dialects as there were tribal groups, something like nine, possibly more. Along came the Russians, consolidated settlements and moved people around and a number of dialects disappeared. The documented dialects remaining were the Eastern Aleut, the Atkan and the Attuan dialects. Then during WWII, the Japanese invaded Attu and moved the Aleut community there to Japan while the US moved the remaining Aleut population to the Alaskan mainland. 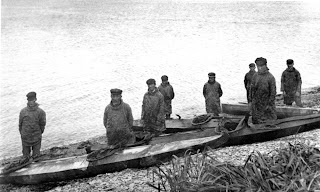 After WWII, Aleuts were repatriated, Attuans moved to Atka and so the only two dialects that were still alive were the Atkan and the Eastern Aleut. So when Bergsland collected his list of kayak terminology, he had some historical sources available that documented Attuan terms and speakers of both the Atkan and Eastern Aleut dialects. Not surprisingly, documented Attuan terms are fewer in number than for the other two remaining dialects at the time that Bergsland did his compilation. And terminology varied over time so that some kayak part may have been called one thing in the 19th century and then something else in the 20th. Keeping all of this straight is not an easy thing. On top of that, we have to deal with Bergsland's dense and sometimes cryptic writing style. I give one example here. 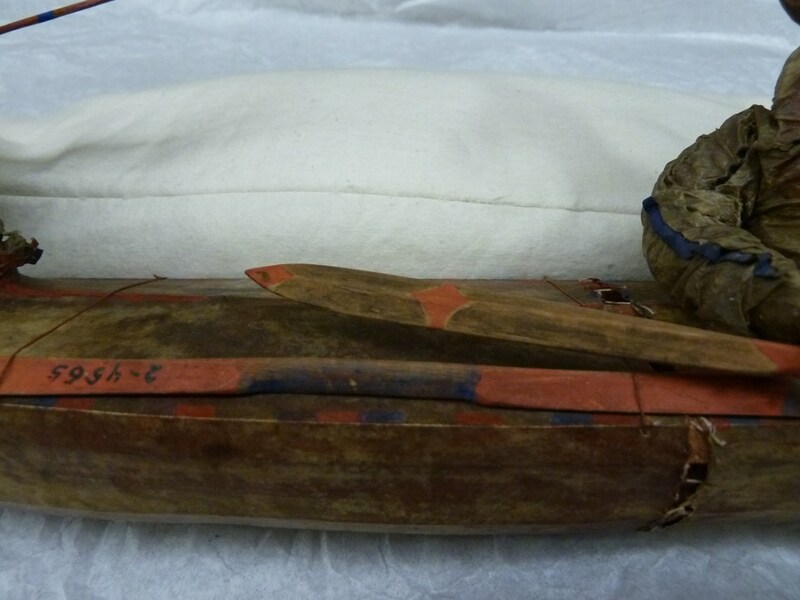 "On top of the taamx^aax^, on the right side in front of the hatch, there was a hook for holding the paddle when not used, made of wood or baleen, or sometimes ivory (Atka 1952), possibly in the shape of a sea otter (Jochelson 1952:131), called in western EA (1909, 1950) x^aach(a)g^iilux^, in AA (1840, 1952) haachachag^iilux^, derived with the suffixes -g^i- + -alug^- 'place for having -' from the above-mentioned term for paddle, EA (1778-) x^aasi-x, AA Au hassi-x." inhale. and so on he goes. So you rub your eyes, go back to the start of the paragraph, try to match up the English with the Aleut term the two of which are invariably separated by a string of parenthetical phrases and hope you don't miss the period that lets you know that you have finally arrived at the end of the sentence. By the way, the AA, Au and EA sprinkeled liberally around the sentence are abbreviations for the dialects respectively, Atkan Aleut, Attuan Aleut and Eastern Aleut. You get the idea. I thought it might be nice to have a version of this that puts the Aleut term right with a picture of what it is referring to. I might put the pictures and words in this blog if I can make that work, the problem being that the blog software controls the size of the pictures, (small) and the layout of the text. Stay tuned. 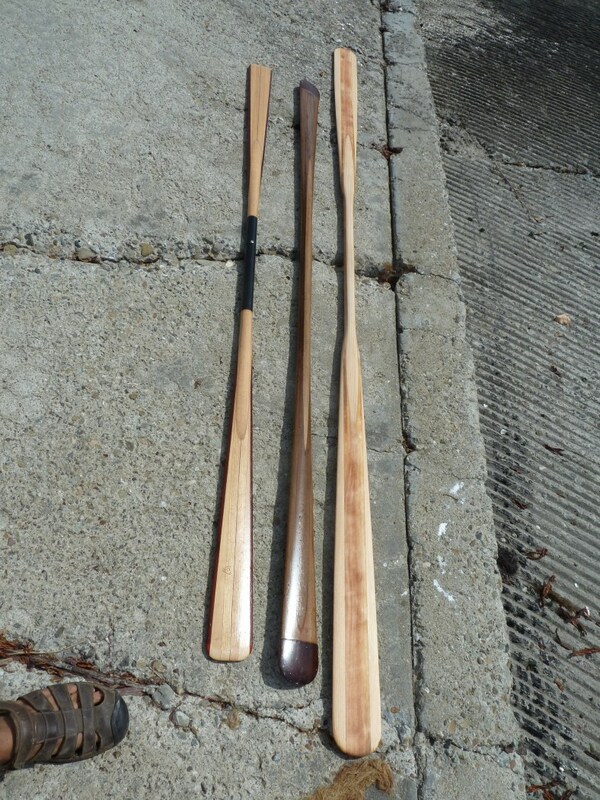 Three Greenland style paddles on display at the boat ramp where I just got done testing them. The breakdown paddle on the left had the tips thinned. The one in the middle had the varnish touched up. 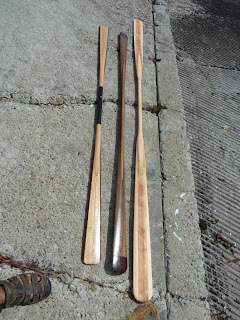 Note that the paddle in the middle has a more curved face than the one on the left which has a flatter, thinner face. The one on the right, the long one, is one I just finished carving. I recently did some maintenance on two paddles for a client of mine. One of the paddles was just worn and needed a little sanding and a coat or three of fresh varnish. The other one was making noises in use because the tips were too blunt so I made the tips sharper. Before returning the paddles, I took them out to test because that is the right thing to do when you make a repair and charge someone for it. Oh yes, there was also a third paddle, one that was supposed to be a blank for a paddle making class that a prospective student's wife had given him as a Christmas present. Three years or more passed and the student still hadn't managed to arrange a class date to finish the paddle, so I finished it just get the thing out of my shop. And so while I was testing the other two paddles, I thought I would test this one as well. Things got off to a slow start. 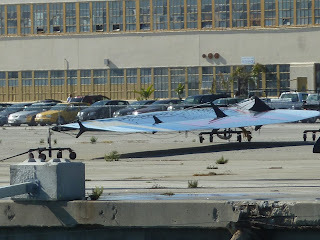 The boat I used for a test vehicle belonged to someone else and had very slack deck lines that made it hard to keep spare paddles on deck but after some experimentation, I managed to figure out a way to carry the spare paddles while testing. Paddle testing for me is usually comparative. Given my testing tools which consist of myself as motor and test evaluator, a gps as speed indicator, a kayak and some suitable body of water to float the boat and offer resistance to forward progress, the tests tend to be subjective and relative. That is, I don't have absolute numbers at the end of the test. I take several paddles, paddle back and forth and compare the performance of the paddles under more or less identical conditions. The two things I can measure are speed and the amount of effort I put into paddling. Effort is hard to measure so it usually means that I try to make the boat go as fast as I can with a given paddle. And when I am going as fast as I can, I measure the speed with the GPS. Usually what happens is that one paddle feels better than another or one paddle gives me a higher top speed than another. And in general, results tend to be vague impressions more than anything rigidly scientific. But some good can come out of even an unscientific test, as happened in this case. Let me share my observations. As expected with the three paddles pictured above, the long paddle gave me the best top speed. This paddle was 98 inches long. The two shorter paddles were both 84 inches long. Normally I like a paddle that is somewhere between 88 and 92 inches long so I expected the 84 inch paddles to be slightly underpowered. As it turned out, they produced top speeds not that much slower than the long paddle. Acceleration with the short paddles was lower than with the long paddle, but by and large, once I got the boat going, the short paddles did pretty well. What was happening was that the hull speed of the boat was the limiting factor in the test and not the paddles. That is, the short paddles were adequate for getting the boat up to hull speed but couldn't push the boat much beyond that. And that's probably adequate for most situations. The long paddle with its greater blade surface could push the boat beyond its hull speed but at the expense of greater effort. So the problem with testing paddles using a GPS and a slow boat is that just about any paddle can push the boat up to hull speed and further effort even with a larger paddle produces little extra speed so that measurement of top speed are more an indication of the boat's limitations than any measure of the paddle's effectiveness. 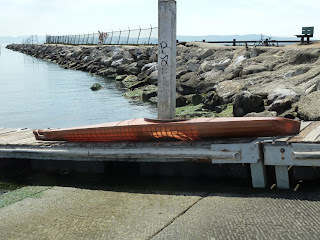 It would be nice to have a meter that could measure the speed of the boat, the resistance offered by the boat and the power needed by the paddler to keep the boat at that speed. 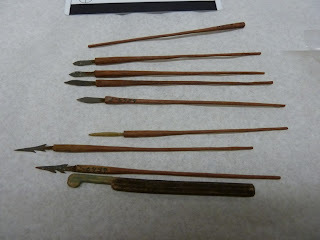 If such a thing were available, it would be able to offer a good comparative test of different paddles' effectiveness. Even if two paddles were able to bring a given boat up to the same speed, the one that requires less effort by the paddler would be the better paddle. However, since there is no good way to measure that effort, it is hard to make meaningful claims about the effectiveness of one paddle vs. another and the question of which of two paddles is the better one remains largely subjective. I know what you're thinking. That boat was warped on account of that concrete pillar coming out of the cockpit. But not so. The concrete pillar coming out of the cockpit is an accident of framing. I could tell when I was taking the picture that maybe my framing was not that good, but I was not in the mood to reposition the boat just for a picture. Anyway, what I am trying to show here, and it may be more obvious if you click on the photo to see a larger version of it, is that the sheer line has gone into reverse, that is, the sheer is higher in the middle than at the ends. And the bottom of the boat has flattened out to the point of almost no rocker. The sheer line for the non-nautical is the line made by the tops of the gunwales, that is, the two boards that form the edge of the deck. 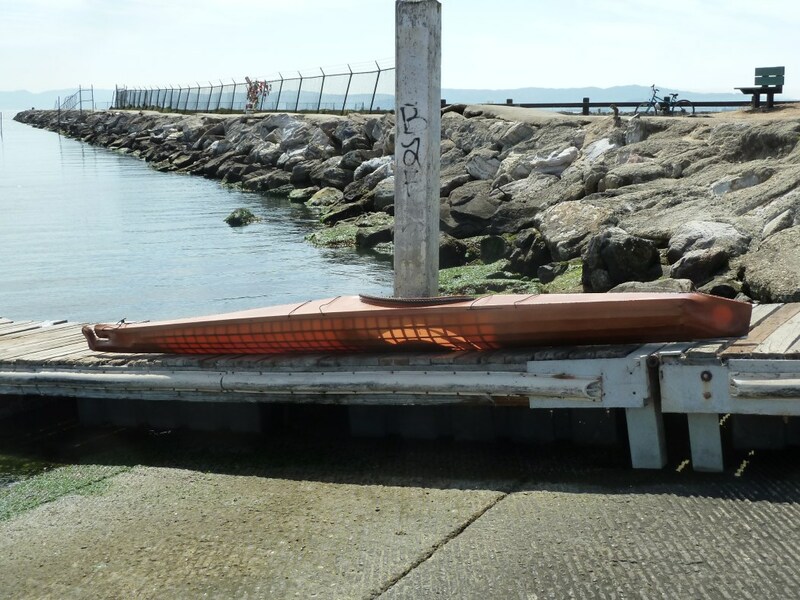 This was not a boat I built, but I am sure that when it was built, it had more sheer and rocker and that the downward movement of the bow and stern with respect to the middle of the boat was the result of the nylon skin tightening up over time. The other thing I noticed when I build boats is that since both the keelson and the stringers are bent into place over the ribs, they exert a downward force on the ends of the kayak that combined with the force of a shrinking skin will tend to make the keel line of a skin on frame boat more straight over time. I am theorizing here, but the Unangan (Aleut) builders always built their keelsons in two or three parts and the parts were carved into a curved shape, not bent into place to avoid this kind of downward pressure on the ends of the boat.